In an attempt to minimize flood damage from hurricanes, some communities on the East Coast are promoting construction on stilts. Elevating buildings allows storm surges to flow underneath structures rather than hitting them broadside. West Coast communities are starting to get into (onto?) stilts for another reason: to avoid damage and deaths due to tsunami. 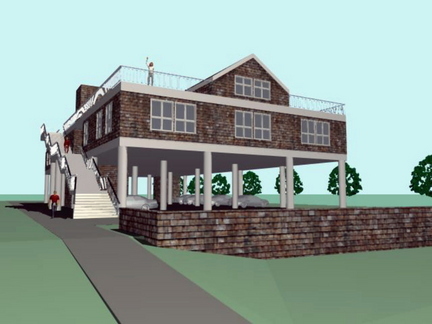 A small town in coastal Oregon has broken ground for a new municipal structure on stilts. Communities in the Midwest that are prone to flooding rivers might also consider this technique of construction. Flooding will likely become more common due to climate change, deforestation, paving of otherwise permeable soil, and population pressures that will drive people to build in flood plains. Stilt-construction may open markets for new building products manufacturers who anticipate demand and develop solutions. Increased demand for railings and stairs. Improved methods for bringing utilities up to building. Soffits for underside of building. More efficient ways to build and brace elevated framing. Furnishings, lighting, and pavings for under building. Increased insulation due to exposure of building underside. Frangible links that allow auxiliary parts of structures to wash away without damaging critical structures. Contact me if you want to brainstorm how stilted construction might impact your business. Newer PostIs the internet private?